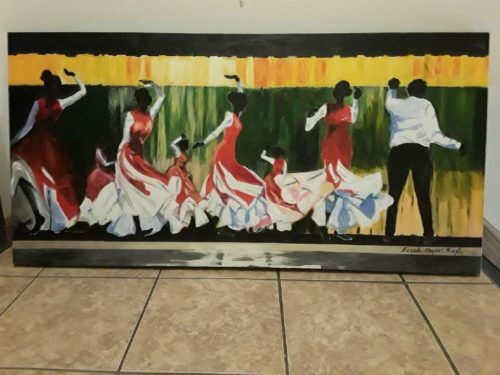 Whether she picks up a wooden paintbrush to start her vivid paintings or puts needle to thread while creating her fashion designs, Incarnation parishioner Angela Murphy centers her mind into one perspective: giving God the glory. 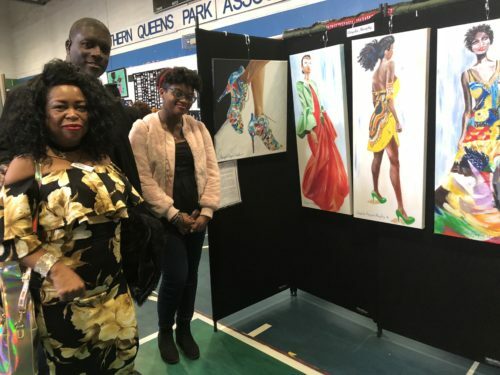 “Before I start to work, I pray and I can see the energy of God in my fingers,” said Murphy, the artist from the Queens Village parish who was showcasing her four-foot tall triptych painting entitled “Fashion Show” for Southern Queens Park Association’s (SQPA) 16th annual art exhibition held at Roy Wilkins Park and Family Center, Jamaica, March 4. 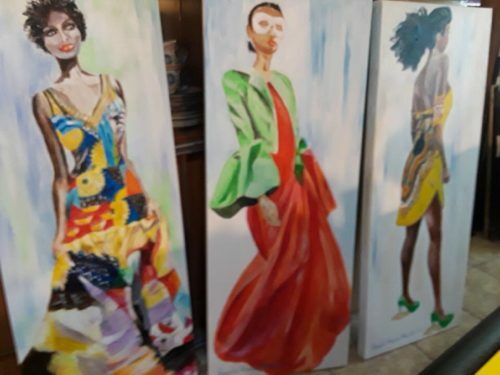 The art piece consisted of three canvas panels showcasing three African-American women in different poses dressed in cultural garbs – one in a mustard-yellow and black modern Kente cloth tube dress, another in a floor-length bell pepper-red gown and one model in a long dress transformed from what could have been fabric designs strung into patchwork. One has to view the three panels as a whole, not separate, so that when looking from a distance, the onlooker becomes the fashion show’s front row audience with the women flawlessly walking down the runway – one turning, one stopping and one with just her profile. Sewing faith and fashion together comes easily for Murphy. The Catholic convert from Barbados joined the faith 22 years ago and she credits her family for encouraging her to pursue her creative passions. Her background and experience included studying fashion design at Parsons School of Design on a scholarship from her home island. She interned in Manhattan and returned home to bring her designs to life. That included creating a dress worn by a Barbados contestant in the Miss Universe pageant. In a turn of events, she came back to the states to further her career while working several jobs to support herself. That’s when she met her husband – which she correlated to divine intervention because they were both praying for a God-fearing partner at the time. As the mother of four, Murphy said her strong values in the pro-life movement drew her closer to the Catholic Church and then eventually as a catechumen. “The abortion subject is so strong that I don’t think people realize how important it is to be a pro-lifer,” she said. When she was pregnant with her youngest daughter Mariah, tests were coming back saying her daughter had Down Syndrome. The teenager standing in front of her mother’s paintings during the exhibit was hanging out with her boyfriend – timid, yet respectful, showing no signs of developmental delays. Back when Murphy was searching for a home parish, she was recommended to Incarnation. She remembered the day when she first attended Mass there and how she sat next to a parishioner who was also a creative artist – the two have both exhibited at SPQA in years past. Murphy expressed gratitude for the support from her parish. Incarnation’s parochial vicar, Father Christopher Bethge, encourages her work as an artist. She said Father Bethge would be bringing one of his classes to the art exhibit to support her craftsmanship. Carlos Bayley, Murphy’s son, recalled his mother’s journey as a designer through the years. “One thing I’ll always remember is that when we were graduating from elementary school, she made all of the graduating outfits for the girls in my class,” said Bayley. While maintaining a living as an artist took sacrifice and working non-conventional hours in order to balance work, life and project deadlines, Murphy takes pride in her purpose as a creator. She’s currently completing her training in art therapy in hopes to help others tackle mental illnesses through a creative outlet. The day before the show, she barely had time to sleep because she was working on one painting entitled “Shoes.” The vibrant sky-blue, lime green and hot pink stiletto shoe was displayed at the exhibit and then was later sold. She laughed remembering how her husband’s encouragement and support helped bring her visions to life once again.